This article is about the geological epoch. For dating the Holocene Era, see Holocene calendar. For the Bon Iver song, see Holocene (song). Subdivision of the Quaternary period according to the ICS, as of 2018. 'Chibanian' and 'Tarantian' are informal, unofficial names proposed to replace the also informal, unofficial 'Middle Pleistocene' and 'Upper Pleistocene' subseries/subepochs respectively. In Europe and North America, the Holocene is subdivided into Preboreal, Boreal, Atlantic, Subboreal, and Subatlantic stages of the Blytt–Sernander time scale. There are many regional subdivisions for the Upper or Late Pleistocene; usually these represent locally recognized cold (glacial) and warm (interglacial) periods. The last glacial period ends with the cold Younger Dryas substage. Look up Holocene in Wiktionary, the free dictionary. The Holocene ( /ˈhɒləˌsiːn, ˈhoʊ-/) is the current geological epoch. It began approximately 11,650 cal years before present, after the last glacial period, which concluded with the Holocene glacial retreat. The Holocene and the preceding Pleistocene together form the Quaternary period. The Holocene has been identified with the current warm period, known as MIS 1. It is considered by some to be an interglacial period within the Pleistocene Epoch. The Holocene has seen the growth and impacts of the human species worldwide, including all its written history, development of major civilizations, and overall significant transition toward urban living in the present. Human impacts on modern-era Earth and its ecosystems may be considered of global significance for future evolution of living species, including approximately synchronous lithospheric evidence, or more recently hydrospheric and atmospheric evidence of human impacts. In July 2018, the International Union of Geological Sciences split the Holocene epoch into three distinct subsections, Greenlandian (11,700 years ago to 8,326 years ago), Northgrippian (8,326 years ago to 4,200 years ago) and Meghalayan (4,200 years ago to the present), as proposed by International Commission on Stratigraphy. The boundary stratotype of Meghalayan is a speleothem in Mawmluh cave in India, and the global auxiliary stratotype is an ice core from Mount Logan in Canada. The name Holocene comes from the Ancient Greek words ὅλος (holos, whole or entire) and καινός (kainos, new), meaning "entirely recent". It is accepted by the International Commission on Stratigraphy that the Holocene started approximately 11,650 cal years BP. The Subcommission on Quaternary Stratigraphy quotes Gibbard and van Kolfschoten in Gradstein Ogg and Smith in stating the term 'Recent' as an alternative to Holocene is invalid and should not be used and also observe that the term Flandrian, derived from marine transgression sediments on the Flanders coast of Belgium has been used as a synonym for Holocene by authors who consider the last 10,000 years should have the same stage-status as previous interglacial events and thus be included in the Pleistocene. The International Commission on Stratigraphy, however, considers the Holocene an epoch following the Pleistocene and specifically the last glacial period. Local names for the last glacial period include the Wisconsinan in North America, the Weichselian in Europe, the Devensian in Britain, the Llanquihue in Chile and the Otiran in New Zealand. The Blytt–Sernander classification of climatic periods initially defined by plant remains in peat mosses, is currently being explored. Geologists working in different regions are studying sea levels, peat bogs and ice core samples by a variety of methods, with a view toward further verifying and refining the Blytt–Sernander sequence. They find a general correspondence across Eurasia and North America, though the method was once thought to be of no interest. The scheme was defined for Northern Europe, but the climate changes were claimed to occur more widely. The periods of the scheme include a few of the final pre-Holocene oscillations of the last glacial period and then classify climates of more recent prehistory. Paleontologists have not defined any faunal stages for the Holocene. If subdivision is necessary, periods of human technological development, such as the Mesolithic, Neolithic, and Bronze Age, are usually used. However, the time periods referenced by these terms vary with the emergence of those technologies in different parts of the world. Climatically, the Holocene may be divided evenly into the Hypsithermal and Neoglacial periods; the boundary coincides with the start of the Bronze Age in Europe. According to some scholars, a third division, the Anthropocene, has now begun. The International Commission on Stratigraphy Subcommission on Quaternary Stratigraphy’s working group on the 'Anthropocene' (a term coined by Paul Crutzen and Eugene Stoermer in 2000) note this term is used to denote the present time interval in which many geologically significant conditions and processes have been profoundly altered by human activities. The 'Anthropocene' is not a formally defined geological unit. Continental motions due to plate tectonics are less than a kilometre over a span of only 10,000 years. However, ice melt caused world sea levels to rise about 35 m (115 ft) in the early part of the Holocene. In addition, many areas above about 40 degrees north latitude had been depressed by the weight of the Pleistocene glaciers and rose as much as 180 m (590 ft) due to post-glacial rebound over the late Pleistocene and Holocene, and are still rising today. The sea level rise and temporary land depression allowed temporary marine incursions into areas that are now far from the sea. Holocene marine fossils are known, for example, from Vermont and Michigan. Other than higher-latitude temporary marine incursions associated with glacial depression, Holocene fossils are found primarily in lakebed, floodplain, and cave deposits. Holocene marine deposits along low-latitude coastlines are rare because the rise in sea levels during the period exceeds any likely tectonic uplift of non-glacial origin. Post-glacial rebound in the Scandinavia region resulted in the formation of the Baltic Sea. The region continues to rise, still causing weak earthquakes across Northern Europe. The equivalent event in North America was the rebound of Hudson Bay, as it shrank from its larger, immediate post-glacial Tyrrell Sea phase, to near its present boundaries. 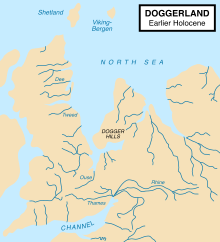 Paleogeographic reconstruction of the North Sea approximately 9,000 years ago during the early Holocene and after the end of the last ice age. Climate has been fairly stable over the Holocene. Ice core records show that before the Holocene there was global warming after the end of the last ice age and cooling periods, but climate changes became more regional at the start of the Younger Dryas. During the transition from the last glacial to the Holocene, the Huelmo–Mascardi Cold Reversal in the Southern Hemisphere began before the Younger Dryas, and the maximum warmth flowed south to north from 11,000 to 7,000 years ago. It appears that this was influenced by the residual glacial ice remaining in the Northern Hemisphere until the later date. The Holocene climatic optimum (HCO) was a period of warming in which the global climate became warmer. However, the warming was probably not uniform across the world. This period of warmth ended about 5,500 years ago with the descent into the Neoglacial and concomitant Neopluvial. At that time, the climate was not unlike today's, but there was a slightly warmer period from the 10th–14th centuries known as the Medieval Warm Period. This was followed by the Little Ice Age, from the 13th or 14th century to the mid-19th century. Compared to glacial conditions, habitable zones have expanded northwards, reaching their northernmost point during the HCO. Greater moisture in the polar regions has caused the disappearance of steppe-tundra. The temporal and spatial extent of Holocene climate change is an area of considerable uncertainty, with radiative forcing recently proposed to be the origin of cycles identified in the North Atlantic region. Climate cyclicity through the Holocene (Bond events) has been observed in or near marine settings and is strongly controlled by glacial input to the North Atlantic. Periodicities of ≈2500, ≈1500, and ≈1000 years are generally observed in the North Atlantic. At the same time spectral analyses of the continental record, which is remote from oceanic influence, reveal persistent periodicities of 1,000 and 500 years that may correspond to solar activity variations during the Holocene epoch. A 1,500-year cycle corresponding to the North Atlantic oceanic circulation may have had widespread global distribution in the Late Holocene. Animal and plant life have not evolved much during the relatively short Holocene, but there have been major shifts in the distributions of plants and animals. A number of large animals including mammoths and mastodons, saber-toothed cats like Smilodon and Homotherium, and giant sloths disappeared in the late Pleistocene and early Holocene—especially in North America, where animals that survived elsewhere (including horses and camels) became extinct. This extinction of American megafauna has been explained as caused by the arrival of the ancestors of Amerindians; though most scientists assert that climatic change also contributed. In addition, a controversial bolide impact over North America has been hypothesized to have triggered the Younger Dryas. Throughout the world, ecosystems in cooler climates that were previously regional have been isolated in higher altitude ecological "islands". The 8.2 ka event, an abrupt cold spell recorded as a negative excursion in the δ18O record lasting 400 years, is the most prominent climatic event occurring in the Holocene epoch, and may have marked a resurgence of ice cover. It has been suggested that this event was caused by the final drainage of Lake Agassiz, which had been confined by the glaciers, disrupting the thermohaline circulation of the Atlantic. Subsequent research, however, suggested that the discharge was probably superimposed upon a longer episode of cooler climate lasting up to 600 years and observed that the extent of the area affected was unclear. The beginning of the Holocene corresponds with the beginning of the Mesolithic age in most of Europe, but in regions such as the Middle East and Anatolia with a very early neolithisation, Epipaleolithic is preferred in place of Mesolithic. Cultures in this period include Hamburgian, Federmesser, and the Natufian culture, during which the oldest inhabited places still existing on Earth were first settled, such as Jericho in the Middle East. There is also evolving archeological evidence of proto-religion at locations such as Göbekli Tepe, as long ago as the 9th millennium BCE. Both are followed by the aceramic Neolithic (Pre-Pottery Neolithic A and Pre-Pottery Neolithic B) and the pottery Neolithic. The Late Holocene brought advancements such as the bow and arrow and saw new methods of warfare in North America. Spear throwers and their large points were replaced by the bow and arrow with its small narrow points beginning in Oregon and Washington. Villages built on defensive bluffs indicate increased warfare, leading to food gathering in communal groups for protection rather than individual hunting. In Mesoamerica, transformations of natural environments have been a common feature at least since the mid-Holocene, mostly through the exploitation of wild plants and the establishment of crops. ^ a b Cohen, K.M. ; Finney, S.C.; Gibbard, P.L. ; Fan, J.-X. "International Chronostratigraphic Chart". International Commission on Stratigraphy. Retrieved July 10, 2018. ^ a b "IUGS ratifies Holocene". Retrieved 18 August 2018. ^ a b "announcement ICS chart v2018/07". Retrieved 9 August 2018. ^ "Holocene". Merriam-Webster Dictionary. Retrieved February 11, 2018. ^ "Holocene". Dictionary.com Unabridged. Random House. Retrieved February 11, 2018. ^ a b Walker, Mike; Johnsen, Sigfus; Rasmussen, Sune Olander; Popp, Trevor; Steffensen, Jorgen-Peder; Gibrard, Phil; Hoek, Wim; Lowe, John; Andrews, John; Bjo Rck, Svante; Cwynar, Les C.; Hughen, Konrad; Kersahw, Peter; Kromer, Bernd; Litt, Thomas; Lowe, David J.; Nakagawa, Takeshi; Newnham, Rewi; Schwander, Jakob (2009). "Formal definition and dating of the GSSP (Global Stratotype Section and Point) for the base of the Holocene using the Greenland NGRIP ice core, and selected auxiliary records" (PDF). Journal of Quaternary Science. 24 (1): 3–17. Bibcode:2009JQS....24....3W. doi:10.1002/jqs.1227. ^ Fan, Junxuan; Hou, Xudong. "International Chronostratigraphic Chart". International Commission on Stratigraphy. Retrieved June 18, 2016. ^ Amos, Jonathan (2018-07-18). "Welcome to the Meghalayan Age a new phase in history". BBC News. ^ "Collapse of civilizations worldwide defines youngest unit of the Geologic Time Scale". ^ "Holocene". Online Etymology Dictionary. ^ Gibbard, P.L. (January 4, 2016). "History of the stratigraphical nomenclature of the glacial period". Subcommission on Quaternary Stratigraphy. International Commission on Stratigraphy. Retrieved June 18, 2017. ^ Clayton, Lee; Moran, Stephen R. (1982). "Chronology of late wisconsinan glaciation in middle North America". Quaternary Science Reviews. 1 (1): 55–82. Bibcode:1982QSRv....1...55C. doi:10.1016/0277-3791(82)90019-1. ^ Svendsen, John Inge; Astakhov, Valery I.; Bolshiyanov, Dimitri Yu. ; Demidov, Igor; Dowdeswell, Julian A.; Gataullin, Valery; Hjort, Christian; Hubberten, Hans W.; Larsen, Eiliv; Mangerud, Jan; Melles, Martin; Moller, Per; Saarnisto, Matti; Siegert, Martin J. (March 1999). "Maximum extent of the Eurasian ice sheets in the Barents and Kara Sea region during the Weichselian" (PDF). Boreas. 28 (1): 234–242. doi:10.1111/j.1502-3885.1999.tb00217.x. ^ Eyles, Nicholas; McCabe, A. Marshall (1989). "The Late Devensian (<22,000 BP) Irish Sea Basin: The sedimentary record of a collapsed ice sheet margin". Quaternary Science Reviews. 8 (4): 307–351. Bibcode:1989QSRv....8..307E. doi:10.1016/0277-3791(89)90034-6. ^ Denton, G.H. ; Lowell, T.V. ; Heusser, C.J. ; Schluchter, C.; Andersern, B.G. ; Heusser, Linda E.; Moreno, P.I. ; Marchant, D.R. (1999). "Geomorphology, stratigraphy, and radiocarbon chronology of LlanquihueDrift in the area of the Southern Lake District, Seno Reloncavi, and Isla Grande de Chiloe, Chile" (PDF). Geografiska Annaler Series a Physical Geography. 81A (2): 167–229. doi:10.1111/j.0435-3676.1999.00057.x. ^ Newnham, R.M. ; Vandergoes, M.J.; Hendy, C.H. ; Lowe, D.J. ; Preusser, F. (February 2007). "A terrestrial palynological record for the last two glacial cycles from southwestern New Zealand". Quaternary Science Reviews. 26 (3–4): 517–535. Bibcode:2007QSRv...26..517N. doi:10.1016/j.quascirev.2006.05.005. ^ Mangerud, Jan; Anderson, Svend T.; Berglund, Bjorn E.; Donner, Joakim J. (October 1, 1974). "Quaternary stratigraphy of Norden: a proposal for terminology and classification" (PDF). Boreas. 3 (3): 109–128. doi:10.1111/j.1502-3885.1974.tb00669.x. ^ Pearce, Fred (March 15, 2007). With Speed and Violence. Beacon Press. p. 21. ISBN 978-0-8070-8576-9. ^ "Working Group on the "Anthropocene"". Subcommission on Quaternary Stratigraphy. International Commission on Stratigraphy. January 4, 2016. Retrieved June 18, 2017. ^ Gray, Louise (October 7, 2009). "England is sinking while Scotland rises above sea levels, according to new study". The Daily Telegraph. Retrieved June 10, 2014. ^ Bond, G.; et al. (1997). "A Pervasive Millennial-Scale Cycle in North Atlantic Holocene and Glacial Climates" (PDF). Science. 278 (5341): 1257–1266. Bibcode:1997Sci...278.1257B. doi:10.1126/science.278.5341.1257. Archived from the original (PDF) on 2008-02-27. ^ Bond, G.; et al. (2001). "Persistent Solar Influence on North Atlantic Climate During the Holocene". Science. 294 (5549): 2130–2136. Bibcode:2001Sci...294.2130B. doi:10.1126/science.1065680. PMID 11739949. ^ Bianchi, G.G. ; McCave, I.N. (1999). "Holocene periodicity in North Atlantic climate and deep-ocean flow south of Iceland". Nature. 397 (6719): 515–517. Bibcode:1999Natur.397..515B. doi:10.1038/17362. ^ Viau, A.E. ; Gajewski, K.; Sawada, M.C. ; Fines, P. (2006). "Millennial-scale temperature variations in North America during the Holocene". Journal of Geophysical Research. 111 (D9): D09102. Bibcode:2006JGRD..111.9102V. doi:10.1029/2005JD006031. ^ Debret, M.; Sebag, D.; Crosta, X.; Massei, N.; Petit, J.-R.; Chapron, E.; Bout-Roumazeilles, V. (2009). "Evidence from wavelet analysis for a mid-Holocene transition in global climate forcing" (PDF). Quaternary Science Reviews. 28 (25): 2675–2688. Bibcode:2009QSRv...28.2675D. doi:10.1016/j.quascirev.2009.06.005. ^ a b Kravchinsky, V.A. ; Langereis, C.G. ; Walker, S.D. ; Dlusskiy, K.G. ; White, D. (2013). "Discovery of Holocene millennial climate cycles in the Asian continental interior: Has the sun been governing the continental climate?". Global and Planetary Change. 110: 386–396. Bibcode:2013GPC...110..386K. doi:10.1016/j.gloplacha.2013.02.011. ^ Dalton, Rex (May 17, 2007). "Blast from the Past? A controversial new idea suggests that a big space rock exploded on or above North America at the end of the last ice age" (PDF). Nature. 447 (7142): 256–257. Bibcode:2007Natur.447..256D. doi:10.1038/447256a. PMID 17507957. Archived from the original (PDF) on December 1, 2017. ^ Singh, Ashbindu (2005). One Planet, Many People: Atlas of Our Changing Environment. United Nations Environment Programme. p. 4. ISBN 9789280725711. ^ Barber, D.C; Dyke, A.; Hillaire-Marcel, C.; Jennings, A.E. ; Andrews, J.T. ; Kerwin, M.W. ; Bilodeau, G.; McNeely, R.; Southon, J.; Morehead, M.D. ; Gagnon, J.-M. (July 22, 1999). "Forcing of the cold event of 8,200 years ago by catastrophic drainage of Laurentide lakes". Nature. 400 (6742): 344–348. Bibcode:1999Natur.400..344B. doi:10.1038/22504. ^ Rohling, Eelco J.; Pälike, Heiko (April 21, 2005). "Centennial-scale climate cooling with a sudden event around 8,200 years ago". Nature. 434 (7036): 975–979. Bibcode:2005Natur.434..975R. doi:10.1038/nature03421. PMID 15846336. Kenyon, Kathleen Mary (1911). "Jericho" . In Chisholm, Hugh (ed.). Encyclopædia Britannica (11th ed.). Cambridge University Press. ^ Curry, Andrew (November 2008). "Göbekli Tepe: The World's First Temple?". Smithsonian Institution. Retrieved March 14, 2009. ^ Snow, Dean R. (2010). Archaeology of Native North America. Upper Saddle River NJ: Prentice Hall. p. 384. ISBN 9780136156864. ^ Franco-Gaviria, Felipe. (2018). "The human impact imprint on modern pollen spectra of the Mayan lands" (PDF). Boletín de la Sociedad Geológica Mexicana, 70. 70: 61–78. doi:10.18268/BSGM2018v70n1a4. Roberts, Neil (2014). The Holocene: an environmental history (3rd ed.). Malden, MA: Wiley-Blackwell. ISBN 978-1-4051-5521-2. Mackay, A.W. ; Battarbee, R.W. ; Birks, H.J.B. ; et al., eds. (2003). Global change in the Holocene. London: Arnold. ISBN 978-0-340-76223-3. Hunt, C.O. ; Rabett, R.J. (2014). "Holocene landscape intervention and plant food production strategies in island and mainland Southeast Asia". Journal of Archaeological Science. 51: 22–33. doi:10.1016/j.jas.2013.12.011. Wikimedia Commons has media related to Holocene. Wikisource has the text of the 1911 Encyclopædia Britannica article Holocene.